The Matrix PB offers five inches of contour depth and an optional lumbar sacral support. The lateral support extends throughout the height of the back. An example of an appropriate client, may be someone who is more kyphotic less active and requires more lateral stability. 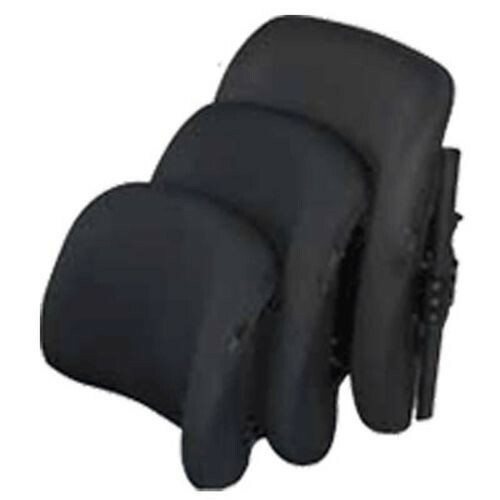 The back shell is a durable lightweight ABS shell and includes a reinforced plate for the headrest attachment. The outer cover is moisture resistant and breathable with an optional privacy flap available. The Matrix PB features a molded high resiliency foam, which wraps around the edges and attached with embedded Velcro making this removable and replaceable part. Because of the wrap design, it reduces the bulk at the front edge of that of the lateral for the consumer. Optional foam place kit can be ordered for the Matrix PB back to individually mold insert for mild moderate postural asymmetries. This back is available in standard sizes 14-inch, 16, 17, 18, 20-inches wide up to 300 pounds weight capacity. Backs 22-inches and wider up to 30 inches wide, are considered heavy duty and have a weight capacity of 500 pounds. The Matrix PB Deep offers the same features as the Matrix PB back but has seven inches of contour depth for even greater postural stability. There is an optional foam place kit available and it has an optional high stretch cover. The PB Deep is available in standard sizes 14, 16, 17, 18 and 20-inch wide, heavy-duty sizes 20, 22 and 24 inch up to 500 pounds and extra wide sizes 24 to 30 inches up to 500 pounds.